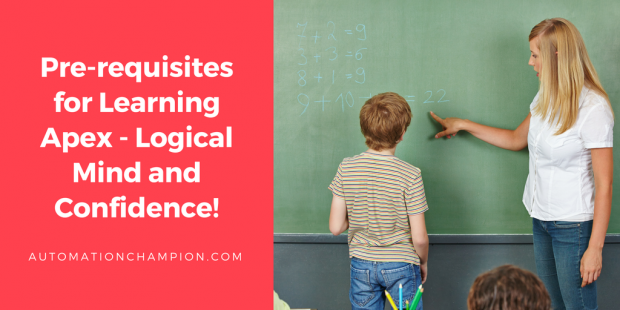 Pre-requisites for Learning Apex – Logical Mind and Confidence! 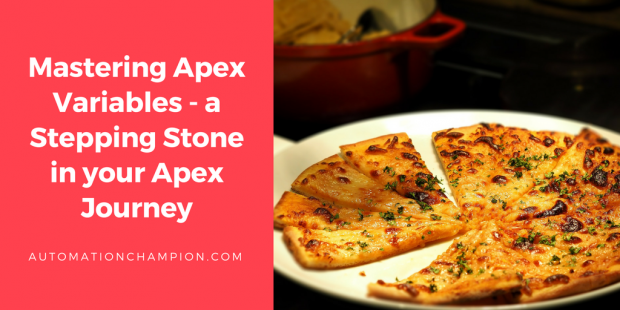 In my last article Mastering Apex Variables – a Stepping Stone in your Apex Journey I discussed about Variables and Data Types. There were few assignments for you in that article, if you did not get a chance to complete it, do it right now. It will not take more than 30 minutes to complete them. Irrespective of whether you are a newbie, just starting a career as a Salesforce Developer, or have some programming background, I would suggest you complete the assignments. The assignments will help you to, either learn few new things or, at the least, brush up your concepts. Many of you wonder, and have asked me repeatedly – Are there any prerequisites to start learning Apex Programming? To that, my simple answer is – yes! However, my recommended prerequisites are not practicing ABCs of Apex! But, it is to cultivate your ability to build logic! My recommendation is not only based on my own experience but, also that of my friends and mentees – many of whom did not have any programming background; yet, by sharpening their abilities to develop models logically – i.e., develop Pseudocodes – almost on the fly – they have gone on to become great Developers. Many Apex learners before you have started, and many after you will start, their Apex journey without any programming background. Out of this bunch, many have gone on to become successful Developers and many will do the same in the future. In short, if you venture your Apex journey without any programming experience or background, you will not be bestowed with a ‘pioneer medal’! But, if you do follow my suggestions and recommendations, the probability that you will go on to become a sought after Salesforce Developer is high. The only other thing that you will need, after cultivating logical skills, is confidence! That is what I learnt from my experience – If a guy like, me who did not go to an English Medium school, or got a formal English language training, can publish 5 books – back-to-back – then anyone can achieve anything as long as they are determined to do so. Apex is just a programming language – not a rocket science! You can do it! So, let us get started – dust yourself, cultivate a logical mind and, take your next step with full force and confidence!. Salesforce offers lots of content to get you started on your Apex journey. If you are just starting your Salesforce Developer career then read this article – Creatively Decode Your Salesforce Developer Journey – to get some guidance, as well as, to learn how to achieve your Salesforce Developer goal. Not convinced, and still worried about not having any programming background? Fine, then my recommendation is to meticulously read ‘Head first Java’ book. This is one of the highly recommended programming books for beginners; it won’t hurt to master it before you take a plunge into the world of Apex. My primary purpose, through this and other blogs, is to be your guide and a mentor. As for Apex learning tools – such as browsing through Apex content to get you started on learning the language – there is no shortage of material available on the Web. For example, search for ‘best practice to write Apex trigger’ and you will end up with hundreds of Read the rest of this entry! I am touched, and humbled, to receive hundreds of emails thanking me for writing the following blogs – ‘An Unconventional Path to Getting Salesforce Administrator Certification’ and, ‘Creatively Decode your Salesforce Developer Journey’. Thank you! Many of you ask, and wonder, why I spend so much time writing blogs. The simple answer is, I enjoy it. Teaching – imparting one’s knowledge – is an art of heart. I am grateful to have been bestowed with the ability, and desire, to teach. I am filled with joy when my insights help others. So, thanks to all of you for your feedbacks. I am happy to know that my contributions are helping you to achieve your targeted goals. One of the reasons why my writings resonate with many of you is that I write directly from my experiences. I take the time to jot down my thoughts on paper; then, I revise, and re-revise, my drafts until I can answer ‘Yes’ to the following question – is this worth sharing with the community? If the answer is ‘Yes’, I publish the blog; if, however, the answer is ‘No’ then I go back to the drawing board and restart the cycle. I continue the exercise until I am satisfied with the output beyond any shred of doubt. Many of you email me wondering why, even after following instructions laid out in my blog, or taking few courses on Apex, you are still not comfortable working with Apex? The reason(s) is, none of the courses, blogs, books or training, will help you become masters in your life or in any technology. Books, blogs, courses are mere mediums to guide you. These tools, by itself, will not be enough to achieve your goal. Let me start with an example. Let us say you want to learn swimming. So, with lots of enthusiasm, you sign up for a swim class. Does that mean you will learn swimming? Probably, yes. Probably, no. Swimming class is a mere medium for you to learn swimming – now, whether you will learn or not will depend on your efforts, quality of your coach, and several other factors. The same logic applies in the world of programming. As mentioned, none of the courses, or training, will help you to become a good programmer until and unless you – persistently and diligently – work at, and towards, it on regular basis. Most people leave the world of programming – frustrated and depressed – because they do not see fruits of their hard work soon enough. To reverse this trend, the first thing a budding programmer should do is to change his/her attitude and expectations. Begin by trusting yourself – yes, you can do it too. Apex programming is not a black box; many have learnt before you and many will do so after you! In short, it is not a rocket science. To remove flickers of your doubts – if there are any left even after reading the above paragraphs – let me share with you my experiences when I was attempting to learn Flows. Yes, now I am perceived as one of the seasoned automation champions; but like all masters before me, I too was one of the struggling, budding, students of Flow. Unlike today, when I started learning Flows, there were hardly any blogs or articles about it. It was very hard for me to learn and create solutions using Flows. But I was determined to master Flows. I disregarded frustrations and transcended them. I started exploring any, and all, available resources; spent many hours doing so; and, finally, developed semi-decent Flows at first. Read the rest of this entry!